And he wants to tell you why he might be right. – Read entire story here. Five years ago, even my closest friends were skeptical: You’re leaving the state senate to go raise money to make an environmental film for an audience who doesn’t care, create political cover for President Obama — and heal 100 years of racial wounds? – Read the entire story here. 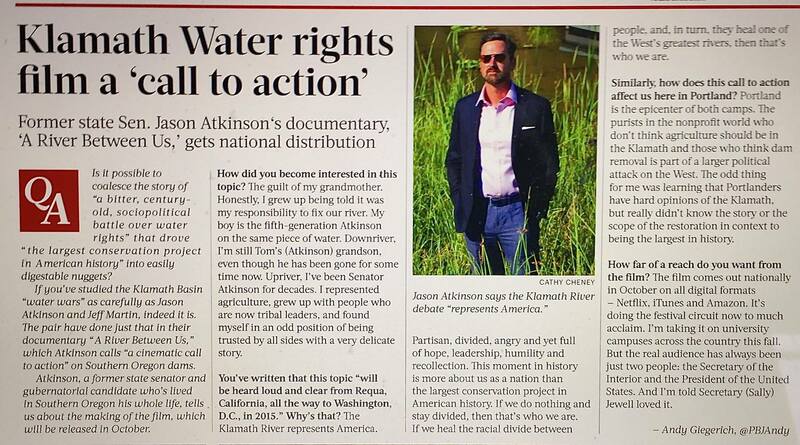 In our weekly PBJ edition (which hit streets Friday), we talked to former Oregon State Senator Jason Atkinson about his latest project, a documentary on the Klamath Basin water wars. Atkinson produced the project with filmmaker Jeff Martin. He calls it a “cinematic call to action” on the myriad issues surrounding dams along the Klamath River. – Read the entire story here. Former state Sen. Jason Atkinson‘s documentary, ‘A River Between Us,’ gets national distribution. – Read the entire story here. The new documentary A River Between Us details the fate of the Klamath River in Oregon and California, and the bitter divides it has birthed over the last two centuries. The river is one of the largest on the western seaboard, and has been exploited since the arrival of the first miners during the great western gold rush. – Read the entire story here. A documentary examining local efforts to transcend the Basin’s contentious water history will have a special five-day screening at Pelican Cinemas. – Read the entire story here. Newly confirmed Oregon Fish and Wildlife Commission member Jason Atkinson will bring his new film documenting the creation of a coalition to restore the Klamath River to Ashland for a weeklong run. – Read the entire story here. “It’s not only the number-one town for making movies, it is also the number-one film festival for movie makers to attend,” emcee Warren Etheredge told a packed house at the Historic Ashland Armory on Sunday evening at the Ashland Independent Film Festival awards. ” – Read the entire story here. Among the amazing movies shown over this long weekend of the five-day Ashland Independent Film Festival, “A River Between Us,” premiering Saturday to a sold-out house at the Ashland Street Cinema, pioneers new ground with a tale of the long-polluted and dammed Klamath River, gradually healing, not with bills and policies, but through the mending of hearts among farmers, fishers and indigenous peoples. – Read the entire story here. It’s rapidly become a famous networking and partying scene, as well as an awesome film-feeding frenzy where you can watch almost 100 novel, thought-provoking, spirit-lifting films, then go off to the designated wine watering hole of the day and chat it all up. – Read the entire story here. Healing a steelhead river. – Read the entire story here. How a war over water in the Klamath Basin — or the lack of it — became a tentative peace agreement among farmers and ranchers, conservationists and tribes is the subject of a new film, “A River Between Us.” – Read the entire story here. A documentary delving into decades-long water controversy in the Klamath Basin is being screened tonight in Portland during a special invitation-only event. – Read the entire story here. A new documentary, “A River Between Us” by former Oregon state senator Jason Atkinson and filmmaker Jeff Martin, examines the history and conflict of the Klamath Basin Comprehensive Agreement, signed in 2014, which would dismantle four dams and open 420 miles of fish habitat, restoring decimated salmon runs by an estimated 80 percent. – Read the entire story here. An in-production, full-length documentary by former state Sen. Jason Atkinson is gaining some early love in the fly-fishing world. – Read the entire story here. A NON-APOLOGETIC STEELHEAD FISHERMAN, Jason Atkinson grew up in Southern Oregon where he had a 14-year political career serving in the Oregon Legislature from 1998 to 2013. – Read the entire story here. Former Oregon state senator Jason Atkinson has co-produced a new documentary about the conflict between users of the Klamath River and how they finally hashed out the historic Klamath Basin Comprehensive Agreement to take out four dams and restore salmon and other habitat. The agreement awaits Congress’ approval. The film, by Atkinson and filmmaker Jeff Martin, is called A River Between Us and comes out this spring. – Read the entire story here. In 1918 the Klamath River, which stretches 263 miles from southern Oregon into northern California, saw its first dam. The development sparked decades of fighting between farmers, native tribes and environmental activists over rights to the river. But in 2014, they set aside their differences and signed the 93-page Klamath Basin Comprehensive Agreement, which would dismantle four dams, opening 420 miles of fish habitat and restoring decimated salmon runs by an estimated 80 percent. Now, the agreement just needs the approval of Congress to be enacted. – Read the entire story here. Restoring the Klamath River and the lands around it is far more than a conservation project; political decisions will have to be made to make it all happen. – Listen to the broadcast here. “Look at the Klamath Basin: It’s long, and it’s complicated. It starts in the high desert; it ends in the redwoods. Everyone in those communities can buy gasoline. If it doesn’t snow, communities are in peril,” said Jason Atkinson, a former Oregon Senator-turned-filmmaker. “Water is more valuable than oil.” – Read the entire story here. A River Between Us goes public. I met Jason two fall chinook seasons ago when he and Joel LaFollette came down to the south coast to fish with me. Over the course of a few days of fishing together, I learned of this amazing conservation effort for the Klamath River. Its an epic story of bringing folks together from very divergent interests and just getting them to talk to one another. Over the course of four years, the people of this community came together for the good of all. – Read the entire post here. Several Octobers back, the tribes of the lower basin arrived at the Klamath Basin Potato Festival in Merrill and, on the banks of the river that has inspired enmity for generations, began cooking salmon on the traditional redwood sticks over madrone embers. – Read the entire story here. The first time I met Jason Atkinson, he was holding a fly rod in one hand and a cold Tecate in the other, resting it on his abdomen.” Minutes earlier he had lodged a rooster fly in his side not due to lack of skill, he will point out it was howling cross winds that afternoon. “This isn’t as bad as the bullet I took to my leg a couple years back.” He belts with confidence. – Read the entire post here. “This river and this story is bigger than fish and it’s much bigger than dams. It’s about the longest water war. It’s about some really old hatreds. It’s about broken politics. And it’s about a group of people who started to lead and got ahead of their politicians to do the right thing.” – Filmmaker Jason Atkinson – Read the entire story here. A little more than 100 years ago, the Klamath River was 255 miles of free-flowing water originating in Southern Oregon that traveled unobstructed through Northern California to the Pacific Ocean. – Read the entire story here. Find out about the Aspen Action Forum, www.aspenactionforum.org. – Watch the video here. After 14 years as an Oregon state senator, including a run for governor, Jason Atkinson turns to film. – Read the entire story here. We are pleased to share this story from the Oregonian about a forthcoming documentary on the Klamath River Basin called “A River Between Us.” The film’s trailer, won for best documentary at the Fly Fishing Film Tour in Portland this past weekend. – Read the entire post here. When I last wrote about Jason Atkinson, the former Oregon state senator and one-time GOP candidate for governor, he was at his southern Oregon farm, trying to decide what to do next after a bittersweet exit from politics. He told me then he was hoping to make a documentary about the Klamath River, and what could be done to save it. – Read the entire story here. I want to share the story of an historic water-sharing agreement which will restore salmon, clean water and – most importantly – peace and prosperity, to one of the most beautiful regions in America. – Read the entire post here.